If you are in a good place financially, where you do not need to make money right now on the side, it doesn’t mean that you shouldn’t be side hustling. In fact, this is a much better position to be in b/c you have the luxury of being patient & making moves that will have a bigger pay off down the road. Will this improve my skillset in valuable ways? We have no excuse to stop learning at any point in our lives. We have a ridiculous amount of information at our fingertips, & we should always be working towards bettering ourselves. Having some sort of side gig can be a great way to encourage yourself to learn new skills & improve upon your natural strengths. Podcasting improves your speaking skills, which in-turn makes networking, interviewing, & public speaking easier. Blogging improves your writing skills so that you can write better ads, resumes, or simple emails. Designing improves your aesthetic & helps you understand what draws people in & what leaves them feeling underwhelmed. Will this connect me to valuable contacts? Volunteering or working as a freelancer on the side are both incredible ways to establish connections within the industry that you want to be a part of. You will learn the ins & outs of the industry, & you will have the chance to prove yourself as an asset. Volunteer positions often turn into paid positions for people who are passionate & serious about their work. 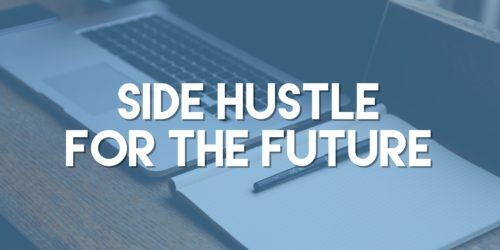 Side hustling for the future means putting in unpaid hours to work towards your dream job. Does this have the potential to grow into a lasting business? If you are starting a side hustle on your own, you should be asking this question. You will want to think further down the road & have ideas of how this side hustle could turn into a full-blown business. Maybe you start building an audience through vlogging, podcasting, blogging, or whatever else you enjoy & are skilled at; but what are you going to do with that captive audience? Even celebrities have to have other ways of monetizing such as products, acting, or guest appearances. They do not make money just b/c they are popular. Think things through & come up with a long-term strategy. Especially since side hustles can be a great way to dip your toe into the water without fully committing to a career change. Build, grow, learn, & then make the switch when the time is right.